Interested in helping your team or league become an Ulti-Mate? ULTI-MATES: YOUR TEAM CAN CHANGE A YOUNG PERSON’S LIFE! The Ulti-Mates Program was created in 2009 to ensure the growth and sustainability of Ultimate Peace (UP) and as an additional vehicle for global intercultural communication and understanding. Raise $1,000 and become an Ulti-Mate! There is no specific time line in which you need to raise the funds. There are several special perks to becoming and Ulti-Mates team and UP partner! Continue reading to find out more. The History of Ultimate Peace – Since 2009, Ultimate Peace (UP) has brought together youth from Palestinian, Arab Israeli, and Israeli Jewish communities to learn, play, and unite around the character-building sport of ultimate frisbee. With a focus on teamwork, personal responsibility, and leadership, youth come together who would otherwise never meet due to the regional conflict. Our vision is that youth from diverse social and cultural backgrounds around the world will build new understandings, share meaningful experiences, and develop lasting relationships in and beyond the UP program. Based on this exposure and these connections, they work collaboratively to bring about sustainable social change as the next generation of peace-building citizens. When we founded UP, we sought to include global ultimate players to embrace our vision and mission. We wanted to let people know how we were going to use the value-based sport of ultimate for an even higher purpose than the joy of playing. Loriana, Liz, and Miranda play for the Seattle Riot in the US. Here they pose for a photo with their new adopted teammates. The History of Ulti-Mates – The Ulti-Mates Program was created to ensure the growth and sustainability of the various Ultimate Peace programs and to create a vehicle for intercultural communication and understanding. Through Ulti-Mates, we hope to involve and integrate players and teams from around the world, thus creating an ongoing connection between developed teams and a developing ultimate program. To date, we have coaches who have volunteered at camp from ten countries across the globe. As a way to draw in international partners, we created a program for teams to set a goal and sponsor a camper who would otherwise not be able to attend camp. At that time, the summer camp was our only program.With the help of current coaches, we were able to partner with an inspirational group of elite club and college teams who became our first group of Ulti-mates in 2009. To best meet the needs of Ultimate Peace in the coming years, we are elevating the Ulti-mates program to a partnership level. The expectations are high due to the needs of our organization, the number of kids waiting to get into UP programs and to ensure that the programs remain at a consistently high level. UP coach shares the Dartmouth Jerseys from one of our first Ulti-mates, with his new team. School-year Leader in Training (LIT) Program; 55 high school students from Arab, Jewish, and Palestinian backgrounds commit to a three-year comprehensive curriculum focused leadership projects and creating/leading UP teams together and in their own communities. The LITs become our UP ambassadors, our community coaches and hold staff positions at summer camp. As Ultimate Peace provides a range of programs and has numerous areas to support, we can now offer our Ulti-mates the opportunity to support any one of these programs, or to put funds where they are needed most. With rampant violence and tensions high in the Middle East, positive action and activities are critical. We have over 100 coaches from the U.S. and beyond who have fundraised and volunteered at camp over the last seven years and who return year after year because they see UP’s transformative effects on the youth and themselves. The costs of running our programs and meeting the needs our current 500+ participants, as well as the youth waiting to be a part of UP, requires a considerable amount of support. We invite you, as an Ultimates team, to be a part of that effort and our journey! 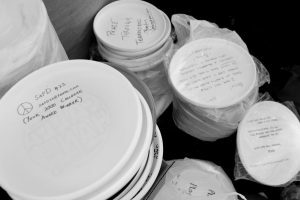 Hundreds of American ultimate players donated frisbees to be given to new young players. Youth, College, Club, Masters club or league teams are all eligible potential Ulti-mates teams. We are asking each Ulti-mates team to donate USD$1,000 or more to help sustain Ultimate Peace programs, though there are additional ways an Ulti-mates team may become more involved. We will stay in touch with our Ulti-mates to foster an ongoing connection between you and the UP youth. It is our hope that by interacting with our kids, Ulti-mates will be inspired to stay in touch with Middle East participants as well as the UP program overall. as well as offering Ulti-mates teams ways to share their partnership status on their own websites. The kids are eager to send special messages, videos and updates about their communities and experiences in UP which Ulti-mates can proudly post. because of those early relationships, and we need to continue to foster that support to provide high level programming to our increasing youth population. team and why you support the work of Ultimate Peace. How? With your teammates, friends and family — anyone! Over the years, teams and individuals, whether specifically partnered with Ulti-mates or not, have raised generous amounts to support UP as a way to promote our mission. Two individuals in Boston have held an all-night indoor tournament, through which they raised thousands of dollars. In 2016, they just held their fifth annual tournament. We have the “secret recipe” for this event that we can share! goaltimate tournament. These events require fewer participants but can raise just as much for UP! baker, ask friends and family to donate baked goods to sell. just hand out info about UP. presentation about UP, or you can show any one of our many powerful videos. If you run a youth clinic, make sure to include parents! Parents love ultimate and they love the work that UP does. various fancy foods and view videos of our UP participants. tournaments. This is a great way to bring even more participants together for UP! One college team sold food in the school library late at night when all other campus food options were closed! Men’s and women’s teams from the same school/college can fundraise together. For example, Pain Train and Princess Layout joined efforts to make Dartmouth an Ulti-mates School! Masters teams can challenge their alma maters’ current college ultimate team to match funds. Ultimate players love a little friendly competition for a good cause! Dig deep into your pockets and ask far and wide. A large team can come up with quite a bit if everyone participates and gives a little! tournaments which can be adapted to your particular event. Want more ideas? Let us know! Riot is thrilled to join Ultimate Peace as an Ulti-mate! We are excited to share our passion for the sport, and promote the positive, supportive and fun culture of Ultimate for the players on our twin team. Sockeye is incredibly proud to support the upcoming Ultimate Peace effort in the Middle East.The clinic promises to be an amazing (and, we hope, transformative) experience for the youth involved, and we are thrilled to be playing some small role in that by sending several players as coaches, and by participating as a team as an Ulti-mate. As an Ulti-mate team, we are helping to sponsor one of the youth teams and, perhaps just as importantly, will continue to connect with and support the team in the years to come. We look forward to hundreds Israeli and Palestinian youth growing up peacefully, loving the Fish and loving the sport. Bodhi Ultimate is proud to take part in the Ulti-Mates program and support the Ultimate Peace project. We hope that our contributions help to spread Ultimate Peace’s message as well as the positive values that our sport promotes on and off the field. Revolver is a team that was founded on the principle of hard work, cooperation, and ethical interactions with teammates and other teams. It’s clear that Ultimate Peace embraces the same principles, so it’s a natural step for Revolver to support your program. We are excited to connect with young players, and more importantly young people, in the Middle East. Rise! Brutesquad couldn’t be more excited to, as an Ulti-Mate, be a part of Ultimate Peace. The program is the ideal way to spread the spirited and supportive culture of frisbee throughout the world. We are genuinely thrilled. When the rules are reasonable and the game fun, everyone wins. Boston Ironside supports every effort to spread Ultimate, peace, and civility–especially among kids. The Wisconsin Hodags are honored to be affiliated with such an awesome and unique program. We give thanks to the individuals who invested the time and effort to make it happen, and are excited to give continued support to the youth involved in the program in the Middle East. If you are searching for a sport whose principles aline with the concept of peace, you need not look further than Ultimate Frisbee. Dartmouth Ultimate is extremely excited and proud to be participating as an Ulti-Mate. The Pain Train and Princess Layout, along with the entire Dartmouth Ultimate community, would like to thank Ultimate Peace for coordinating the event in Tel Aviv. We can’t think of a more valuable way to share our love for the sport than lending a small hand to this program. PoNY is proud to add its name to the list of teams supporting Ultimate Peace. We hail from the most multi-cultural city in the US; ours is a team made up of students, lawyers, civil workers, and free-loaders; we are black, brown, white, and yellow. As such, we understand the power that this sport has to bring people together and create mutual understanding and respect. We can’t wait to hear what comes of the first clinic, and look forward to being part of this program as it grows and grows!